Well, it’s the month of February and Valentine’s Day is the marker. But how much do you really know about your heart? The heart is a muscle that works hard to keep our bodies going by coursing oxygen and nutrients through the bloodstream while at the same time removing metabolic wastes. If there are any clogs in this highly efficient system, your health can be severely compromised. Heart, or Cardiovascular disease is the leading cause of death in the United States, so it’s important to grasp how the heart works and what you can do to keep it going. The basic structure of the heart consists of 4 chambers divided into right and the left sides. The right side of the heart receives blood from the right ventricle (lower region), circulates blood through the lungs to receive oxygen while removing carbon dioxide. The blood from the lungs is then pumped to the left atrium (upper region) where it flows to the left ventricle and through the aorta – the main artery of the body. Here, oxygen is used and metabolized to carbon dioxide. The heart beats as a result of the sinoatrial node, located in the right atrium. This mechanism spontaneously generates an electrical impulse which makes the heart contract and pump. It’s the natural pacemaker of the heart. The heart beats at varying rates, but on average, the resting human heart rate is around 72 beats per minute. Factors, such as activity levels, genetics, and age have some influence over heart rate, and lower resting heart rate is considered good for long term heart health. It’s never too late to incorporate these healthful changes to prevent heart disease. 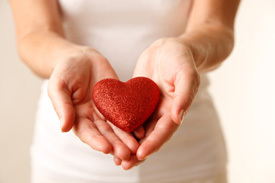 Taking good care of your heart will provide you with a gift that goes beyond Valentine’s day.